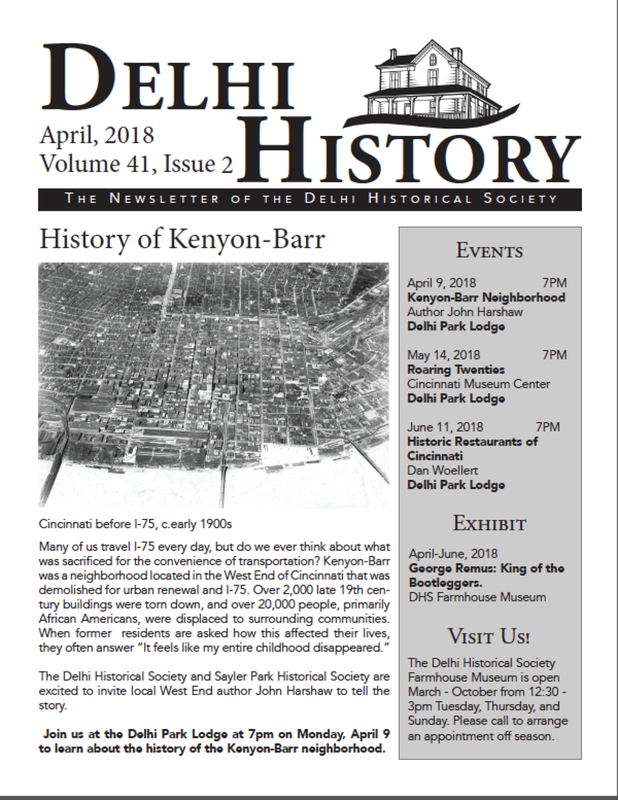 By Peg Schmidt, DHS Trustee and Delhi Township Historian. American Methodists had long been affiliated with the Church of England (Anglican Church), but this state of affairs became untenable after the American Revolution. In response, John Wesley came to the new United States and ordained the first American Methodist elders in 1784. Two wealthy Delhi landowners subscribed to the new religious form and in 1818 decided to start an American Methodist Episcopal congregation in Delhi. The small congregation met for "classes" in Shaw's and William's homes for 10 years, but in 1828, Williams sold an acre of land for $30 to be used as a "burying ground" for members of the church. Burials were already taking place on the property at Anderson Ferry and Foley Road, including William's wife Ann Dugan Williams who died July 3, 1828. The oldest marked grave is that of 11-year-old Roxanna Harding who died in 1822. The deed from Williams stipulated that trustees of the congregation "may erect or cause to be built a place of public worship for members of the Methodist Episcopal Church." John Shaw then offered $34 worth of brick and lumber for construction. Completed in 1831, the church is one of the oldest church structures in Hamilton County still on the original property. Total cost for the church was $303.70. Like most American Methodist Congregations throughout the U.S., Shiloh followed the itinerant model of ministry that saw circuit riders and student ministers provide for the religious needs of the church. These ministers received an annual salary of $75. In the late 1800s Shiloh faced serious financial problems. Class collections and offerings were not enough to cover the operating expenses for heating, kerosene and a janitor (at $3 per month). At one point, the church board voted to discontinue holding worship services as the expenses were far in excess of income. Instead they rented the church to other congregations for their services on Sunday mornings and held their own in the evening. Longtime historical society member Judge Rupert Doan said his father, as a child would accompany the minister out from Price Hill for the Sunday night services. Eventually John and William Rutenschroer agreed to guarantee payment of needed funds that prevented the closing of the little white church. Photo courtesy of the Delhi Historical Society, all rights reserved. The 1920s were stellar years for Shiloh. In 1924, it became a member of the Ohio Conference of the Methodist Church and got its first appointed minister, Vernon Stump, a student at the Lane Theological Seminary. The building was wired with electricity and a year later the parish added a belfry and vestibule. The bell for the tower was a gift from the estate of James Gamble, a prominent member of Westwood Methodist Church. Though the congregation was small (Judge Doan recalled about 40 people attending Sunday services during WW II), it had big ideas. After the war, Delhi boomed, as did Shiloh's population - by 1951 there were 470 members. The community purchased adjacent land in three increments between 1945 and 1955, including a 5-room residence for the pastor. They also built an education center for Sunday school and remodeled the old church. Finally, on Sunday, October 18, 1958 - 140 years from its founding - the congregation moved into a beautiful new church that held 400. The 1960s brought dedications of the organ and tower chimes as well as additional parking. The new fellowship hall and education building were consecrated and the new sanctuary, now debt-free, was dedicated. Shiloh continued to see growth and change. The congregation celebrated 150 years of the Methodist Church, in 1976, the same year as America’s bicentennial. The church also accepted and installed a bronze plaque from the Daughters of the American Revolution in honor of Shiloh’s place as the oldest continuously used church in western Hamilton County. The ’80s and ’90s brought dedications of the etched symbols between the narthex and the sanctuary, the church’s first ramp for handicapped people and the consecration and cornerstone-laying celebration for the new parlor. Shiloh marked its 175th anniversary in 1993. 150 Anniversary Booklet Cover depicting the buildings. Photo Courtesy of the Delhi Historical Society, all rights reserved. The community building was consecrated in 2010. Read Judge Doan's full speech transcription HERE. Shiloh Church. Photo Courtesy of the Delhi Historical Society, all rights reserved. This article was written for our members April 2018 newsletter that arrives by snail mail. If you wish to get the current articles every quarter, please become a member!